Indoor Space Saver Mirrors can assist where a less visually invasive method of surveillance is required. The rectangular shape is also ideal in buildings with low ceilings. Complete with adjustable J-Bracket which attaches to an Aluminum Bar on the back of the mirror face. The 600x400mm Space Saver Mirror is discrete, so it can be used where a less visually intrusive method of surveillance is required. 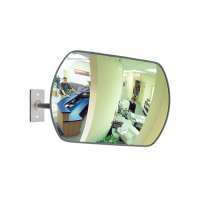 The rectangle shaped Space Saver Mirror is also ideal in buildings with low ceilings. With no back it is lightweight and easy to install.Prices Includes GST and Freight.. The 800x600mm Space Saver Mirror is discrete, so it can be used where a less visually intrusive method of surveillance is required. 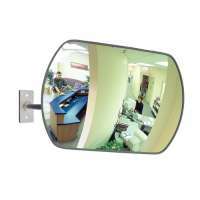 The rectangle shaped Space Saver Mirror is also ideal in buildings with low ceilings. With no back it is lightweight and easy to install.Prices Includes GST and Freight..